Starbucks baristas are pretty talented at creating latte art, but even the most master barista couldn’t create something THIS cute! Let’s hope the caffeine content for this little guy isn’t as high as a pumpkin spice latte, or this mom is in for a loooong night. 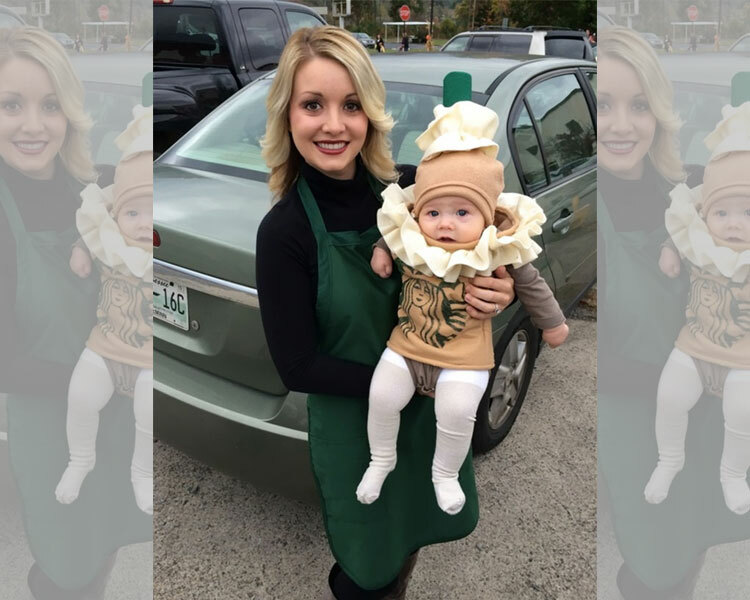 We do have one qualm to make with this costume… mom really should have written the child’s name on the cup with their name spelled incorrectly. If you ever needed proof that Starbucks has become the most recognizable chain in the world, here is that evidence. 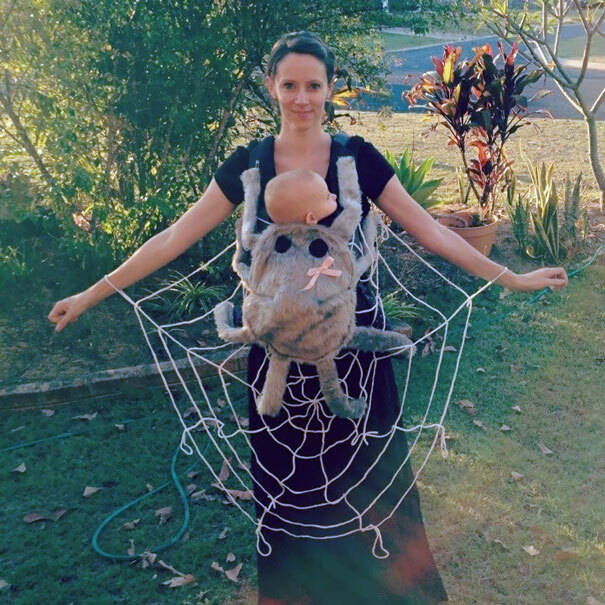 If you are creeped out by spiders and the thought of holding a baby makes you nervous, this is likely to give you nightmares. We have to hand it to this talented momma — she found a really fun and unique way to integrate her baby into a Halloween costume. If you have a little one at home who can’t yet walk, this is a simple costume that will only cost you a couple dollars in materials and a little bit of artistic talent. If there’s one qualm with this costume it’s the restrictive nature of tying the spider web to your wrists. E.T. : The Extraterrestrial is one of the most beloved blockbuster movies of all time. 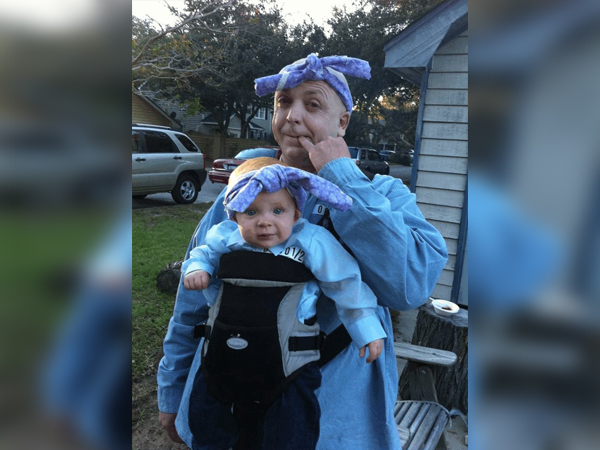 This dad wanted to incorporate their baby boy into their costume and they managed to pull it off with just a few simple pieces of materials. Create some handlebars, add a basket, and buy a solid red hoodie and you’re good to go. This dad scores extra bonus points for creating an E.T. costume for his little boy. We’re sure Steven Spielberg would be proud of this creation and it serves as a comfortable spot for a child to sit while trick-or-treating. One of the most popular themes we have discovered is moms and dads who use their baby carrier as part of their costume. 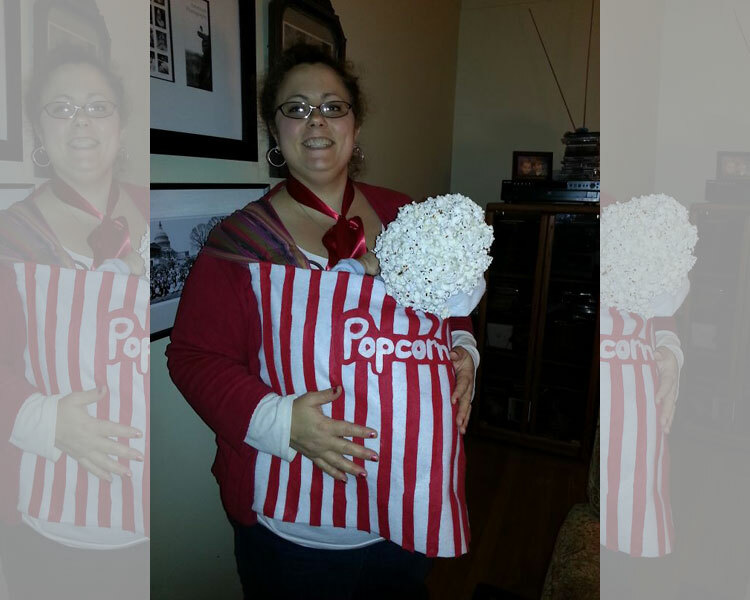 This mom created a simple popcorn cover that slipped over her baby carrier. We love her use of a simple wig to turn her child’s head into a bunch of freshly popped corn. If you’re struggling to put your child into the perfect Halloween costume, why not use stuff you already have lying around the house and add a bit of artistic license to show them off while you carry them around on Halloween. Some of the best child-based Halloween costumes involve themes. 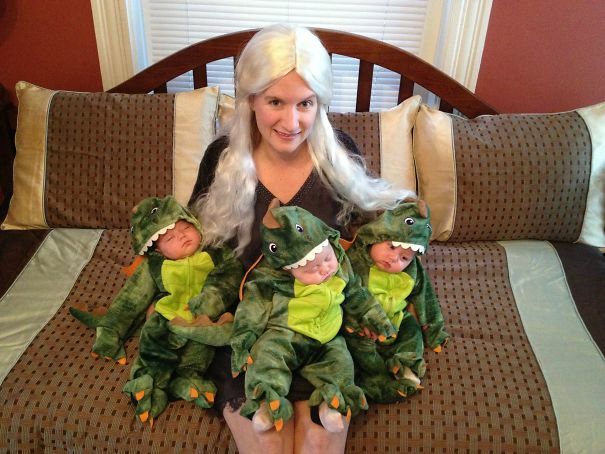 This mom of triplets took a cue from Game of Thrones and dressed her little babies up as her very own family of baby dragons. Daenerys Targaryen would definitely be proud of this “Dragon Queen” and amazed at how incredibly adorable her little baby dragons are on Halloween. Store bought costumes are totally acceptable but they really come to life when a bit of the mom or dad’s personality are injected into the final product. A baby stroller and a bit of artistic freedom can go a long way. 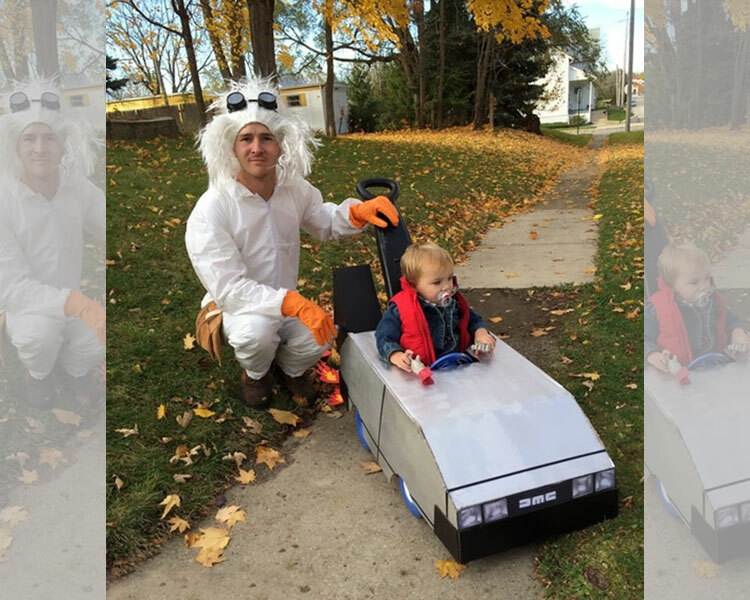 This awesome dad dressed himself up as Doc and then turned his child’s human-propelled toy into a DeLorean. With his little boy in a red vest, he really tied together the entire Halloween costume. Back To The Future may be more than 20 years old (yes you heard that right) but it’s still a popular movie series. A new generation of kids might miss out on Marty McFly and his adventures but this little kid is getting an early education into one of Hollywood’s greatest franchises of all time. 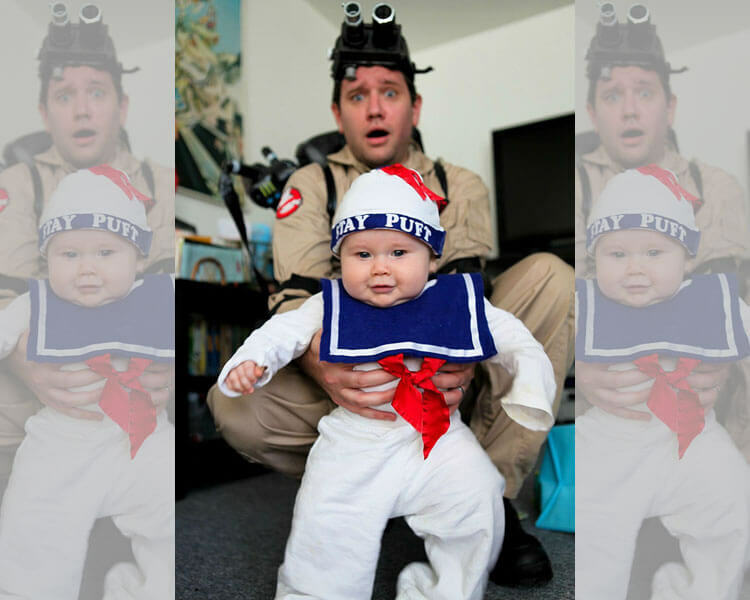 We love that this dad chose to dress up as a Ghostbuster and tied his costume together with help from his little son who plays the role of the Stay Puft Marshmallow Man. We love the looks on both dad and babies faces but we should remind this dad that the Ghostbusters literally melted the Stay Puft Marshmallow Man at the end of the movie. If you’re going to create a Hollywood-based costume, be sure you are getting the right point across or just have a super adorable child who can complete the ensemble like this guy does. This kid probably hasn’t seen Napoleon Dynamite and if they have, it probably didn’t have the same comedic resonance or understanding that it did for his mom. With that being said, their mom did an amazing job of capturing the movies exactly outfits, right down to the makeup box. For the most part, kids will dress up like anything their parents choose if the end result is going door to door and getting a bunch of free Halloween candy in the process. Movie costumes are definitely a popular choice among the best children’s Halloween costumes we discovered. 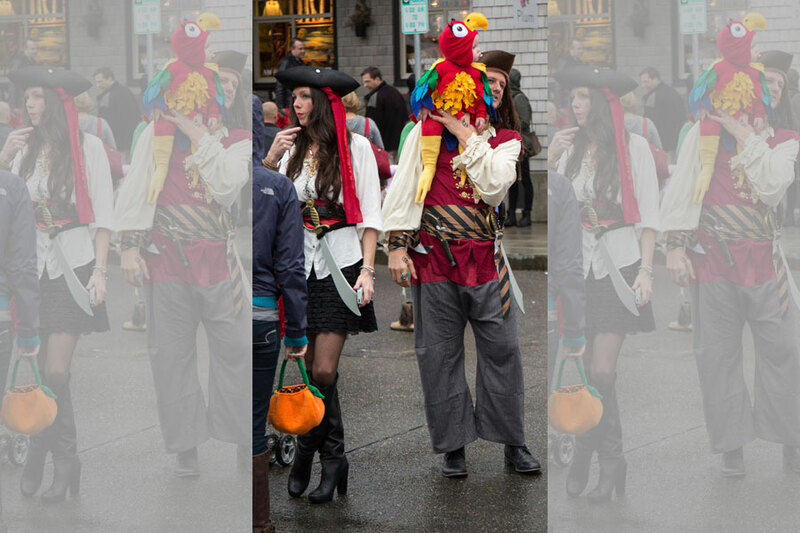 This dad dressed up as a pirate and turned his small children into his trusted sidekick parrot. We have a few problems with this costume. First, it seems a little bit unsafe to balance your child on your shoulder. Second, why would any parent want to carry their child around on their shoulder for hours while collecting candy door-to-door? Perhaps his wife (shown to the left) carries the candy while dad focuses on making sure they don’t drop their small little parent on the ground. We do love that this entire family got in on the Halloween costume game. Unless you have been living under a rock for the last year, you’re probably vastly aware that Pokémon has made a massive resurgence thanks to Pokémon Go. It’s nearly impossible to go anywhere without seeing someone hunting for new Pokémon and battling at gyms. This awesome couple dressed up as characters from the popular children’s cartoon and trading card game. 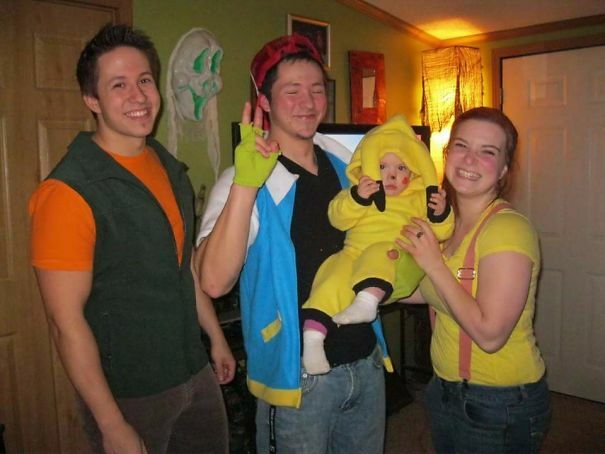 Their baby, of course, was dressed up like Pikachu, the most famous of all the Pokémon characters. This is the cutest little Pikachu we have ever seen — hands down. Chewbacca isn’t capable of talking in a human dialect and neither is this small little baby. In a way, they are the perfect match for each other. Throw in dad’s awesome stormtrooper outfit and you have the perfect making of a father-son Star Wars ensemble. We only have one qualm with this outfit choice — why in the world would Chewy be spending time cradled in the arms of a stormtrooper? 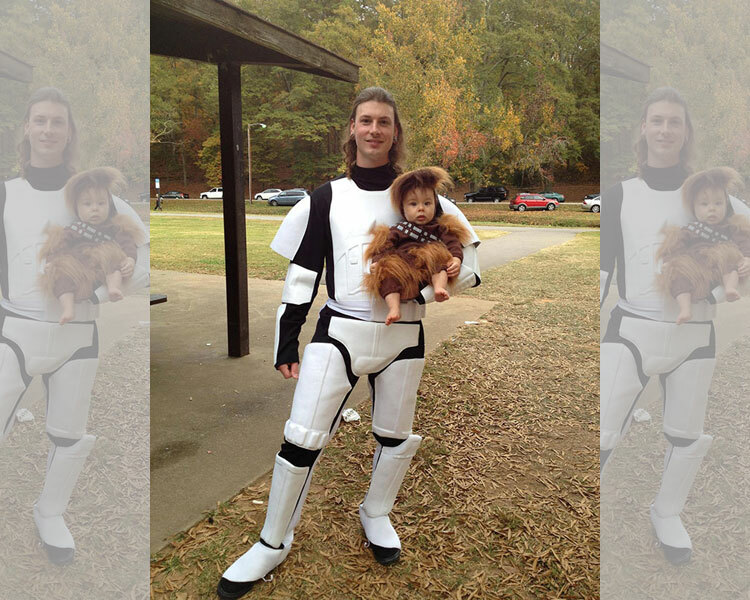 Regardless of our attention to detail for the movie, this dad and their adorable little baby look awesome together in their Star Wars costumes. 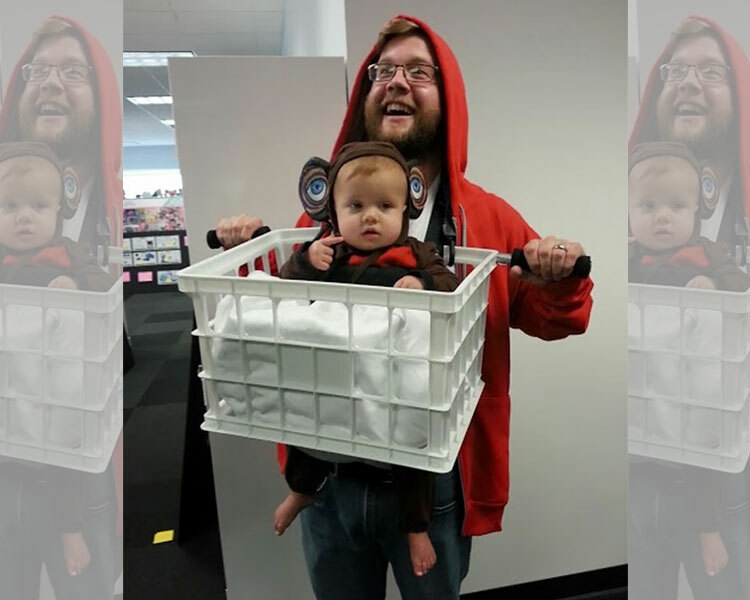 Another baby, another mom, and another baby carried turned into an awesome costume. If your child is not walking yet, this is still the best way to give them an adorable Halloween while keeping your hands free to collect candy. Sure, we know the child won’t eat the candy but that doesn’t mean mom and dad can’t enjoy some sweets while showing off their sweetheart. 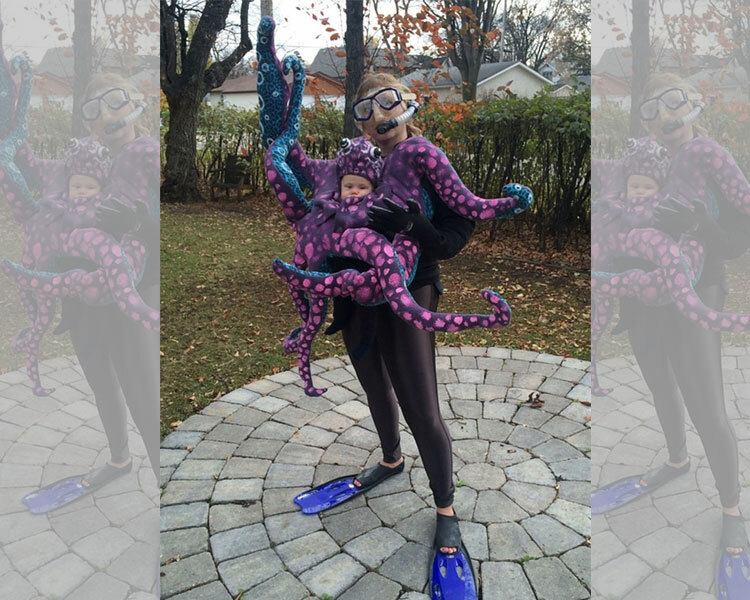 The mom’s flippers add a nice touch to these ocean-inspired Halloween costume. The baby also looks warm and comfortable which is perfect for those cold Halloween nights. This dad is obviously a fan of skunks based on his hat and the outfit he put his daughter in. 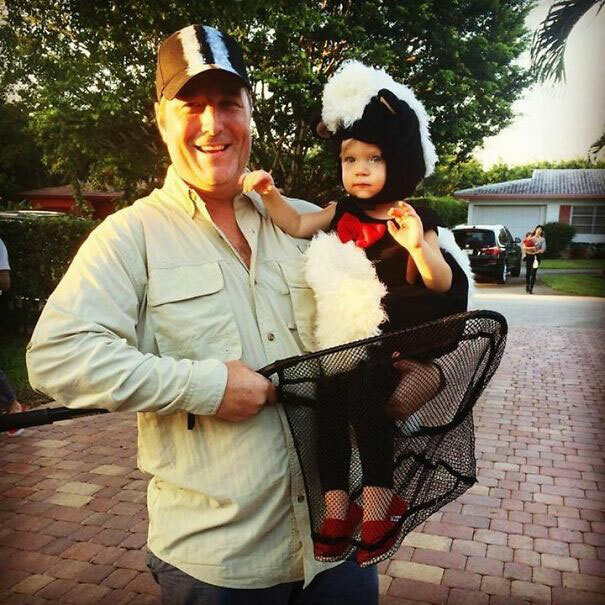 Not only does he proudly display his little Pepé Le Pew for the world to see, he also created a skunk-catching net to carry her in. The trick to creating a fun Halloween costume is to really dive into the purpose behind the outfit. Don’t just throw your child in a costume and set them loose, instead, figure out how you can incorporate your own costume with your child’s to create a silly and truly memorable Halloween memory. In most of the parent and child Halloween ensembles we found, the small child has played the subordinate to the parent’s costume. This time the small child plays the main event. 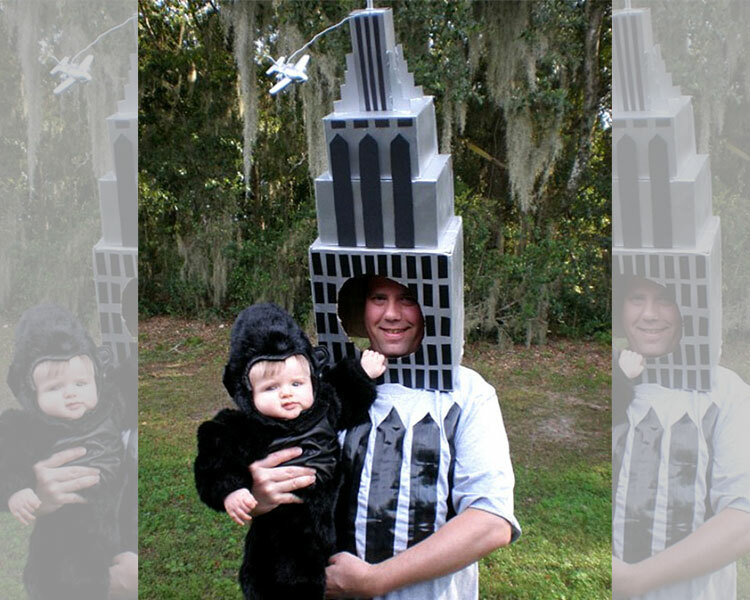 Dad dressed himself up as the Empire State Building and dressed his little adorable baby up as King Kong. Given that Kong climbs the Empire State Building in a final attempt to fend off their enemies, we’re going to go out on a limb and say the child in this scenario is the star of the Halloween costume. Also, does anyone else feel like dad’s costume would get a little bit top heavy very quickly? Well if Darth Vader is Luke Skywalker’s father it only makes sense that at least one photo exists while he was holding Princess Leia. This dad may have purchased his dad-daughter costumes from a big-box retailer but they definitely look adorable posing together in their Halloween costumes. His baby daughter seems really perplexed by the man who is holding her and it’s pretty amusing to see Darth Vader cradling a baby Princess Leia. Is it safe to say Leia was wearing her hair in double buns from a very early age? 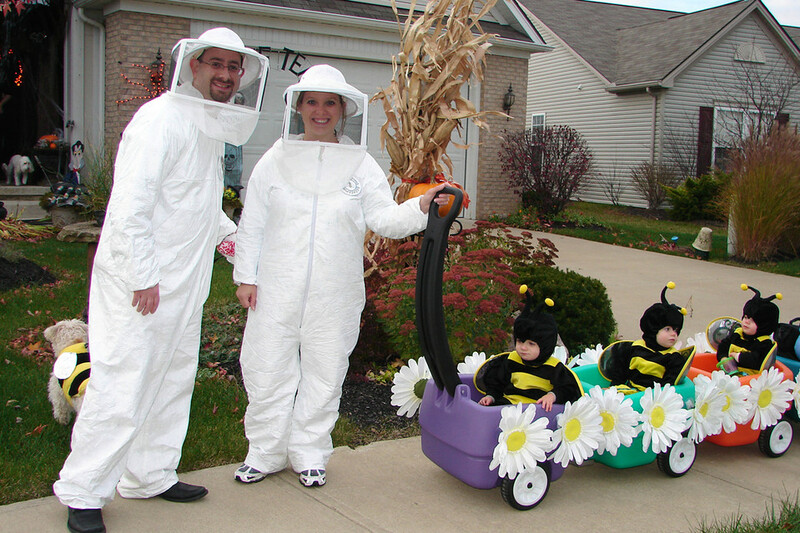 We bet these children bee-haved on Halloween so they could bee-escorted from house to house in an attempt to bee-queth some candy from all of their neighbors. 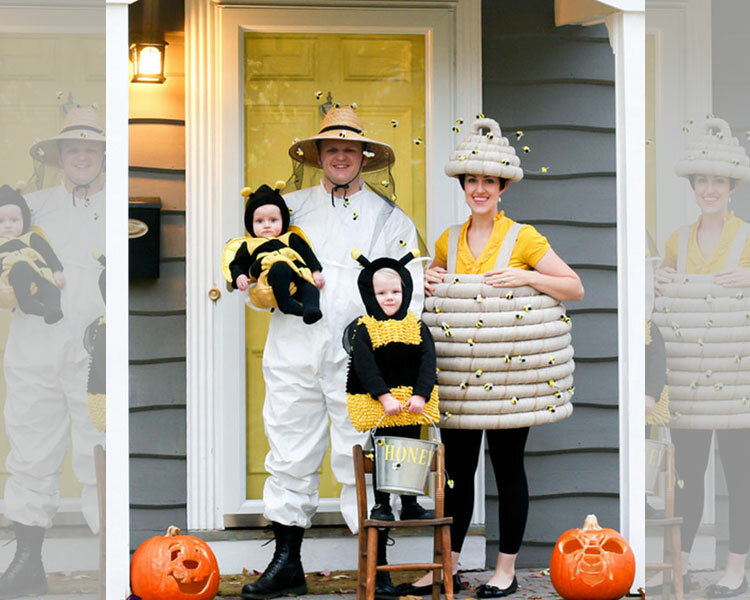 Okay, enough of the bee puns, but we have to admit this family went the extra mile to create a bee colony, a bee-keeper outfit, and even a beehive. Family costumes can be a lot of fun, especially when everyone has their own role which helps to complete the family ensemble. Throw in two adorable children and you have the makings of a viral Halloween ensemble. 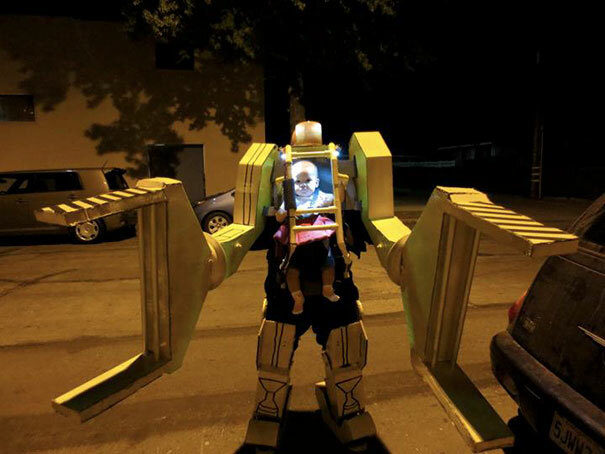 Combining technology with your child and a killer robot idea makes for a really fun and unique costume. 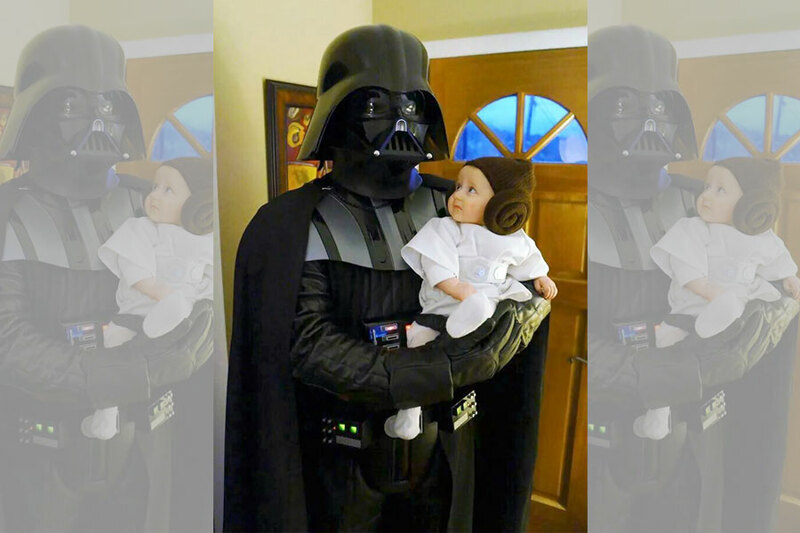 We’re sure this dad put dozens of hours into creating something that would combine their child with a really cool costume. It really looks like the small child is directing the robot from within their control booth. If you want to really impress everyone on Halloween, consider building your own costume and showing it off on the internet. This photo went viral and now dad needs to one up himself every single year. The parents of this baby must be big Tom Hanks fans. This clueless baby was put into a tiny suit with padding to make them extra round so that they could be shaped like a ball. The parents even went so far as to decorate the suit by putting “Wilson’s” face on the front of the suit. This is probably what Wilson would look like if he was actually brought to life. There are probably many people who ogled this baby at how cute and clever the costume was, but the baby hasn’t the slightest idea about what’s going on. Read on to see what other Tom Hanks movie inspired a costume! This is adorable at first sight, but if you really think about it, the prospect of this family ensemble is quite creepy and dark. 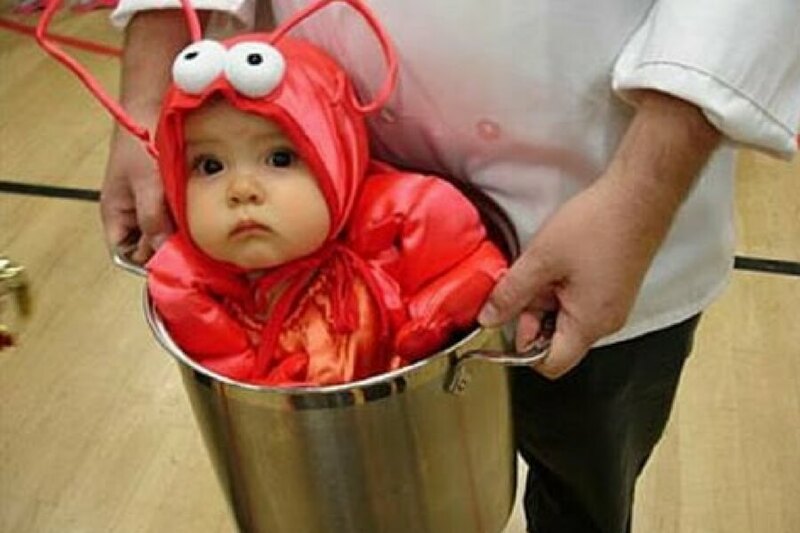 The parents of this clueless baby dressed their bundle of joy in a lobster costume. That alone would have been cute enough! But then, they put their little lobster in a giant pot. And what’s this? Are the parents admiring the cuteness of their creation? Or are they thinking about their next delicious meal? We’re just kidding! Of course, this is all in good fun and it appears that the baby is hungry too from the delicious costume! This costume is truly questionable. 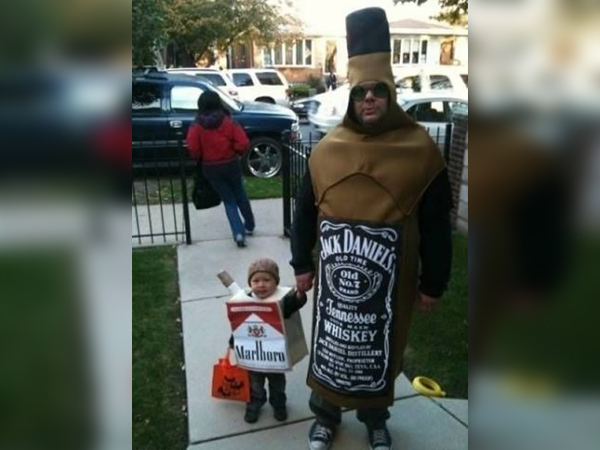 Here we have Dad dressed up as a bottle of Jack Daniels, while his little boy is dressed as a pack of Marlboro cigarettes. 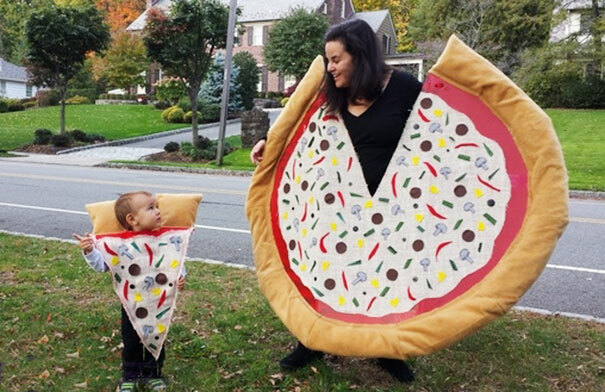 It is cute because the baby is the perfect size to complement this costume pairing. But is it inappropriate? Absolutely. Still, the hilarious costume was probably a hit that Halloween and let’s just hope that this little boy doesn’t see this picture of him when he gets older and starts to get any ideas! Although we’re sure that his parents will put their son on the right path. This next costume is truly a disturbing one! This little girl’s parents dressed their baby up as a mini stripper and even took a picture of her with a pole! Okay, not a real pole, but parents are pros and improvisation. Although this picture is hilarious, it is oh, so wrong. The parents probably bought their daughter a costume that was supposed to be something else, but upon looking at its contents decided to do something funny. Let’s just hope that this picture doesn’t recreate itself when this baby grows up! Her parents would probably not approve then. Maybe Her Parents Really Like Wings? Let’s hope that that is the case with this costume. 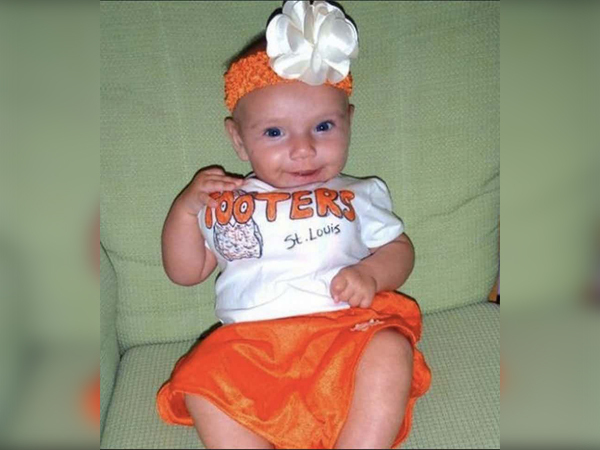 This little girl’s parents must love the wings at Hooters so much that it was the inspiration behind this costume! We’re not sure if they’d be too happy to actually see their baby girl working at Hooters in the future. The parents even went so far as to add the “assets” that Hooters girls are normally known for. To be honest, it looks pretty creepy on a baby! At least this baby isn’t really aware of what is going on with this costume. She probably doesn’t even know she’s wearing one! This costume is perfect for toddlers, even if they don’t know what they’re getting themselves into. 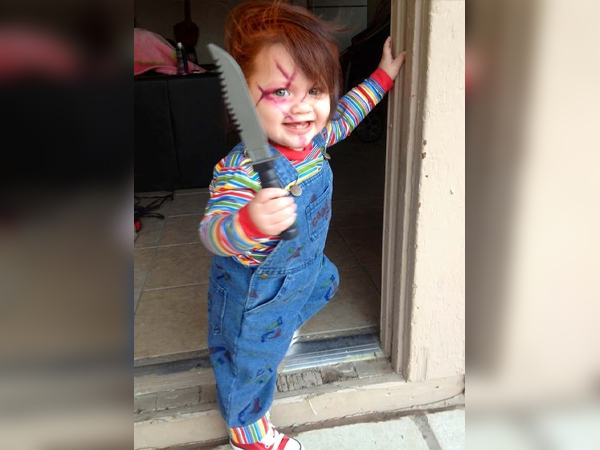 The parents of this baby decided to dress their child up as Chucky and it is all too accurate. They even gave the toddler a knife for full creepy effect! This child is totally unaware that they are representing something scary and that they could possibly haunt many people’s nightmares with how realistic this costume is. We’re sure that the baby is just happy to be holding a fun, sharp toy! Hopefully it is fake and hopefully, the baby doesn’t turn on us. This is one example of a baby who is completely unaware of what is going on. They’re probably wondering why a strange man who resembles their father has so much hair falling from his face. 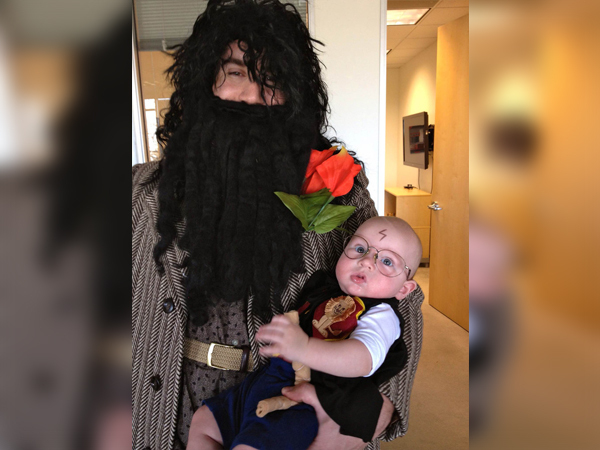 This was a brilliant recreation of Harry Potter and Hagrid, but the baby cannot be more confused. Maybe one day this little boy will grow up to be a Harry Potter fan like a lot of other people and he will look back at this photo and be proud that he has the parents that he does. This is an expert-level costume right here. The parents of this baby found an adorable tiger outfit for their little one on Halloween. But then, they went the extra mile by putting some thought into what they could do with a mere tiger costume. Well, this is the answer. 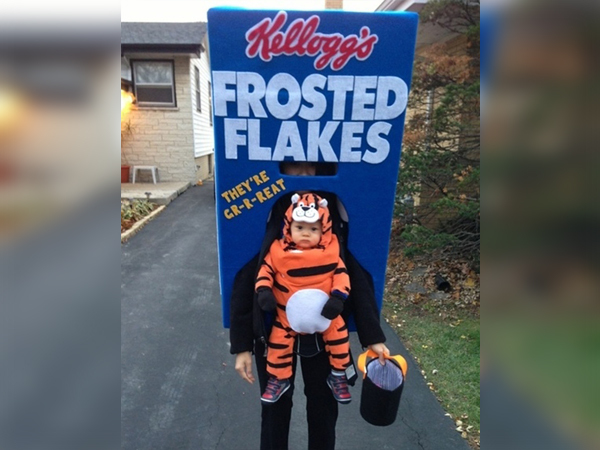 Mom or Dad (we can’t see inside the box) donned a box of Frosted Flakes costume and strapped their baby to their chest so that he could stand in as Tony the Tiger! Brilliant! This costume was sure to get a lot of candy. But this baby looks a little young to be eating candy, so we’re pretty sure the candy was for the parents. Fans of Austin Powers rejoice! There are still people out there who think this is a classic movie. Some of the best characters from that movie are Dr. Evil and it’s even more hilarious when Dr. Evil’s Mini Me is unveiled in the movie. Well, in this case, Dad just happened to be bald and baby hadn’t grown a sufficient amount of hair yet. So what better costume idea than this one? It would have been funny if they had used Dr. Evil and Mini Me’s classic power suits, but opting for the prison wear is just as hilarious. A hard knock life, indeed! This family costume photo is cute, but oh no! This baby doesn’t know that it is in a trap! 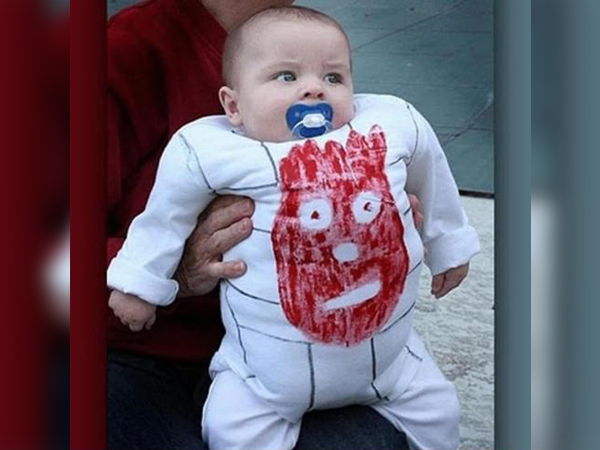 Jokes aside, kudos to the parents for this costume idea, even if it means using their baby as the enemy in this case. 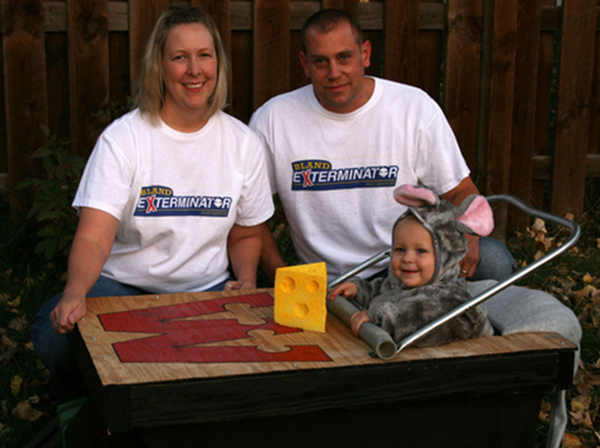 While the parents wear shirts of an extermination company, they dressed their little one in an adorable mouse costume. Then, they fashioned a mouse trap out of a stroller and even gave the baby a piece of fake cheese to play with! 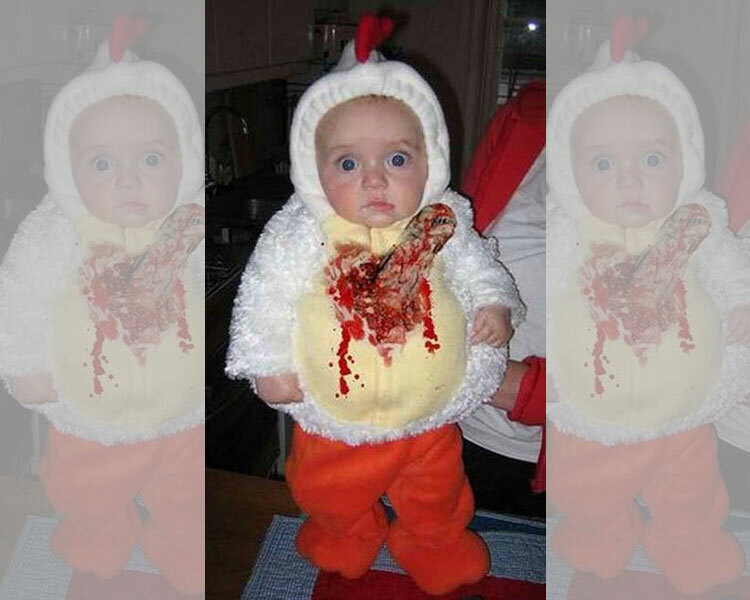 This was a creative costume idea but we’re sure that the baby doesn’t know that it’s practically playing the role of dead meat! What Little Girl Wouldn’t Want To Be A Mermaid? When this little girl said she wanted to be a mermaid for Halloween, this probably isn’t what she had in mind. She was probably thinking something more magical and whimsical, like The Little Mermaid. Instead, she got this disturbingly inappropriate siren costume. First of all, why is the tail blown up and so long? It sort of looks realistic, but it might be a little trouble for people walking around you. Second, the little girl’s top piece for the costume is the most disturbing part. Even more disturbing that Dad is there to hold his daughter’s tail while she wears that top piece. She’s probably wearing sunglasses so no one would recognize her. The parents of this little boy were probably cracking up while taking this picture. They’re probaly still even cracking up right now, because we know we are! 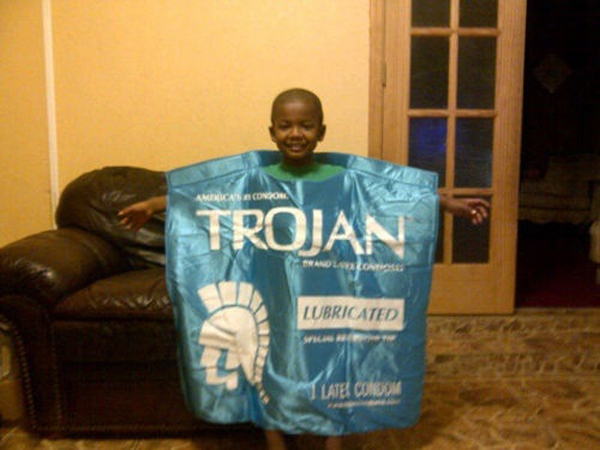 In this hilarious photo, although inappropriate, this little boy’s parents decided to dress him up in a giant contraceptive wrapper. The little boy is smiling but we know the look on his face means that he’s really confused as to why it’s so funny. This costume could also be used as a lesson to show that if you don’t use one thing, you could end up with the other. If you’re not sure what this costume is going for, then look no further than Forrest Gump. 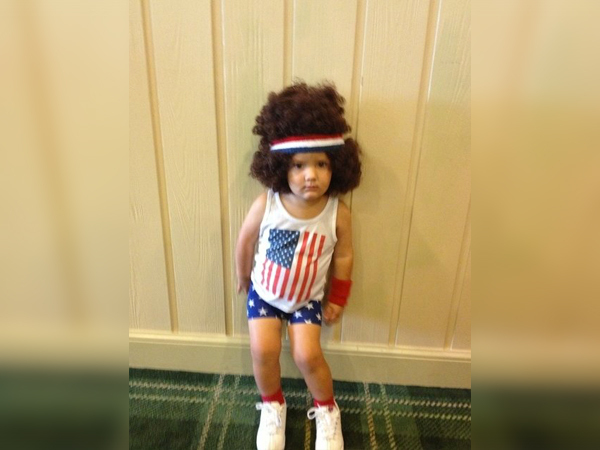 This baby is dressed up as Forrest Gump’s best friend Lieutenant Dan Taylor, post leg loss. This was a brilliant and cute idea! 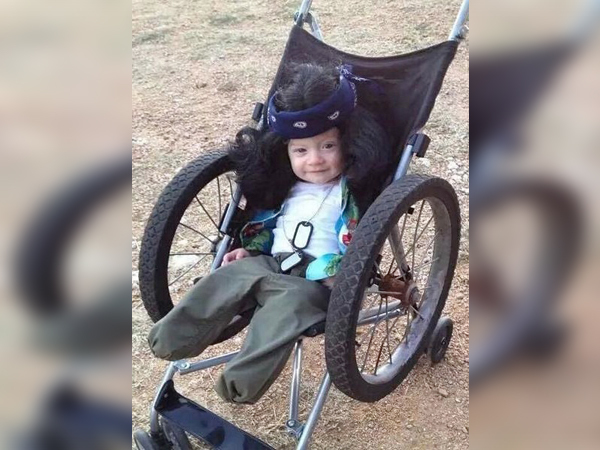 Because Lieutenant Dan was confined to a wheelchair after the war, the parents who came up with this costume needed only to make their stroller look like a wheelchair and they could keep their baby safe in its stroller all Halloween night. Kudos on the getting it to look like the baby had no legs too! This costume idea found on Instagram was certainly a clever one. The parents of this newborn baby decided to dress him or her (because, let’s be honest, there’s no way we could tell from the photo) up as a “little swimmer” labeled the winner. Well, we guess that’s how it happen’s, right? Are we not all the winners in the race to fertilize our mother’s eggs? We’re sure when this baby grows up and sees their parent’s hilarious idea, they will be truly embarrassed. But you got to give the parents credit for this one. A lot of parents will go the cute route or even the funny route with their children’s costumes, as we’ve already seen. But some parents will go the scary route and that’s how you know they are true fans of the spirit of Halloween. Why sacrifice what this holiday means for the sake of your own baby’s cuteness? 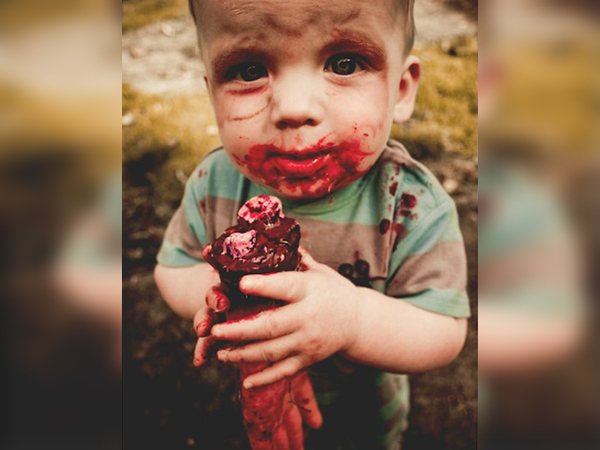 That’s probably what these parents had in mind when they decided to zombi-fy their little baby and even give him a severed hand to nibble on! Although it is a scary costume, we can’t help but admit that it is still incredibly cute! This Baby Pities The Fool! 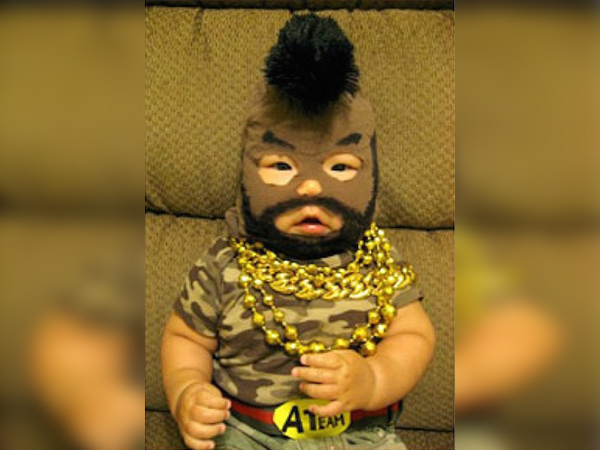 This baby is dressed up as Mr. T from The A Team. The parents achieved this by probably getting a ski mask and cutting holes for the eyes, nose, and mouth, then decorating the mask in Mr. T’s likeness. Now we have the adorable baby Mr. T! Although it probably would have been more funny if the parents had found a child-safe way to recreate Mr. T’s facial hair directly on their child’s face, the baby’s natural hair might have ruined the classic Mr. T mohawk that is going on here. You know what they say, you enter this world in diapers and you leave the same way! 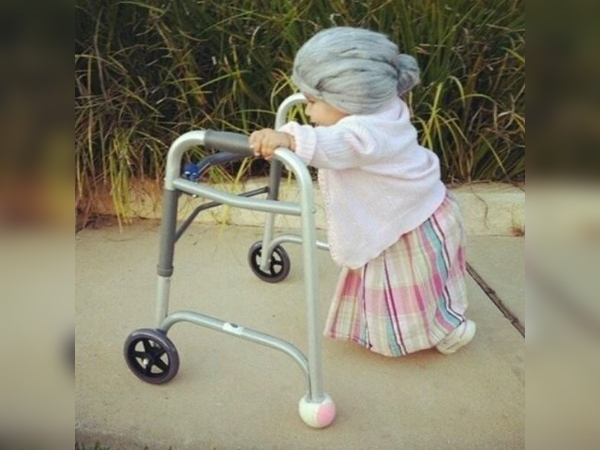 This little girl was dressed up as a granny for Halloween and it is too cute! She even has a mini walker to boot! This is probably super helpful as it will help the baby learn to walk straight, but she probably doesn’t know that she’s dressed up as an old woman. We’re sure that the adorable scene captured a lot of hearts and stole a lot of candy that year, so kudos to the parents for this costume! Anchorman and Will Ferrell fans would agree that this is an awesome costume. 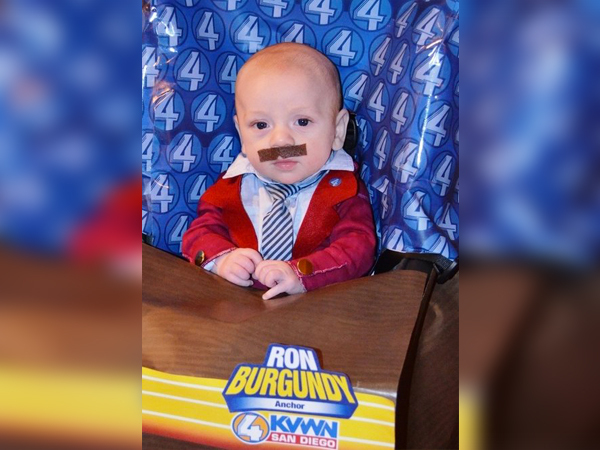 THis little boy’s parents dressed him up as none other than the legendary newscaster Ron Burgundy. They even went the extra mile by recreating Ron Burgundy’s news cast to make it look like he is actually delivering the news! The only thing that separates this baby Ron Burgundy from the real one would be the fact that this baby would probably never think that milk is a bad choice. Hopefully one day this little man can grow a head of hair just like Mr. Burgundy! This Baby Is Ready To Work! 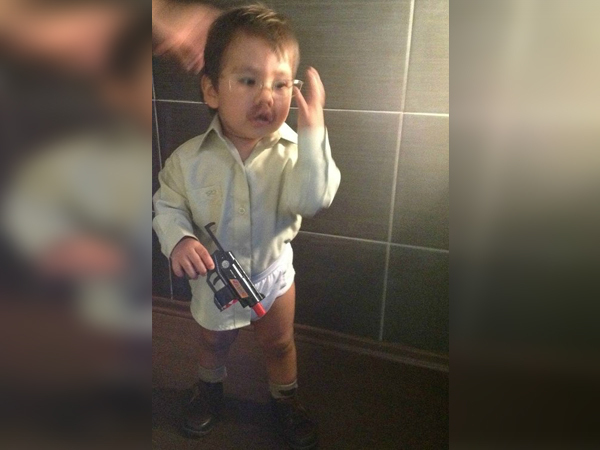 Can you guess who this baby is supposed to be dressed up as? If you guessed Breaking Bad’s Walter White, then you are absolutely correct! This adorable costume even has the baby is a classic Walter White look with no pants and a gun. This baby probably doesn’t know how brilliant his costume is for die-hard Breaking Bad fans, so he probably doesn’t understand why everyone is fussing over his outfit. He probably just sees some Halloween candy and can’t wait to get his little hands on it. One things for sure though, parents will go to great lengths to give their children awesome costumes! There are adorable baby Halloween costumes, and then there is this creepy creation that is probably going to give us nightmares and leave this small child with a complex later in life. The chicken costume was obviously store bought but the added bone protruding from the abdomen was probably made at home. This costume is really tied together by the fact that the small child looks genuinely concerned. 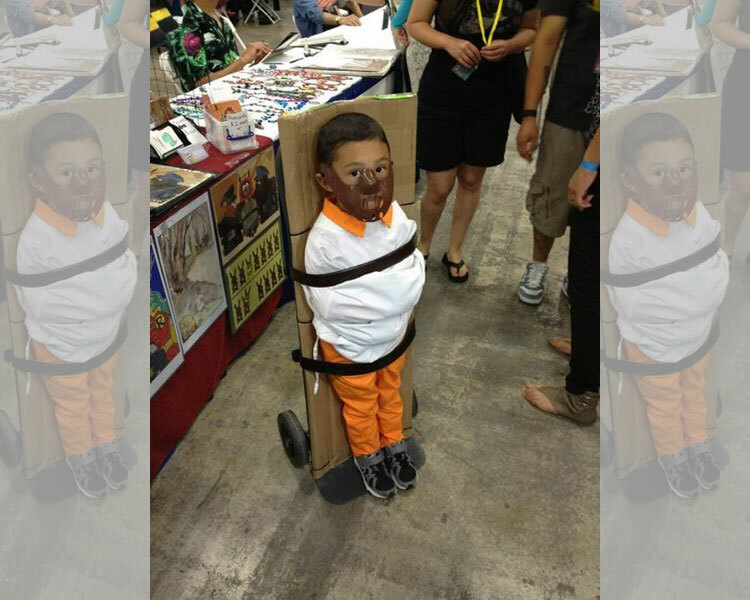 Not all baby costumes have to be adorable and this parent nailed their child’s creepy outfit. 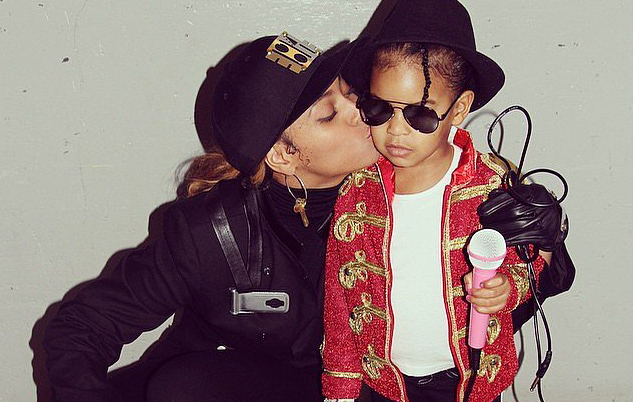 Yup, even celebrities love dressing up their little ones during Halloween. Here are Beyonce and her adorable daughter Blue Ivy a few years ago. In case you couldn’t tell, they’re dressed up as Michael Jackson and his sister, Janet Jackson. The costume is pretty darn good. From that angle, Beyonce definitely looks like Janet. And Blue Ivy also resembles the deceased pop star. We love how she completes the look with her own pink microphone. It makes us wonder if some day the celebrity offspring will make her own way in the music business. We wouldn’t be surprised if she followed in her parents’ footsteps. This trio is a riot. They are obvious fans of Chris Pratt’s mega-successful film franchise Guardians of the Galaxy. 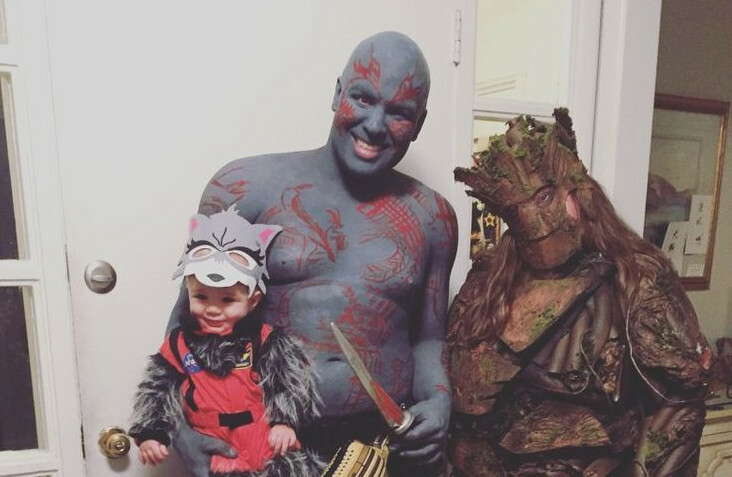 It looks like dad is dressed like Drax (played by Dave Bautista) and mom is Groot (voiced by Vin Diesel). And then there’s the baby, whose size makes her perfect to play the talking racoon Rocket (voiced by Bradley Cooper). You’ve got to give this family props for all the work they put into the costumes. And to safeguard the little one, they used a face mask instead of face paint. They look like they’re having so much fun! If you know you have to carry your little one around on Halloween, you have to come up with some costume ideas that make sense. Well, this mom had a clever idea. 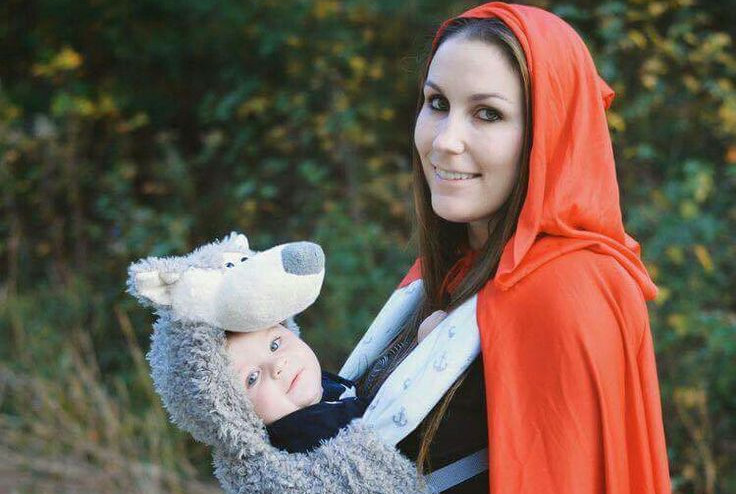 She dressed up as Little Red Riding hood, and she made her infant the Big Bad Wolf. Okay, so the wolf really isn’t too terrifying. Actually, he’s pretty cute. But we love how the plush wolf head sits perched on the baby’s head. We know he’s trying to be fierce, but babies mostly look adorable (unless they’re crying). Thumbs up for this really cute, fairy tale-inspired costume! 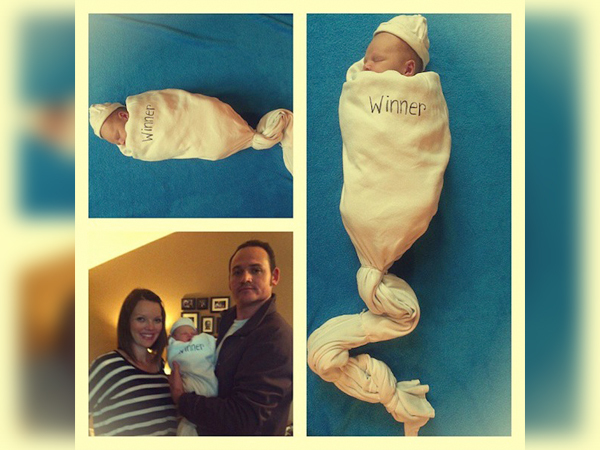 Here’s another family that came up with a clever Halloween idea that incorporates their baby into their costume. 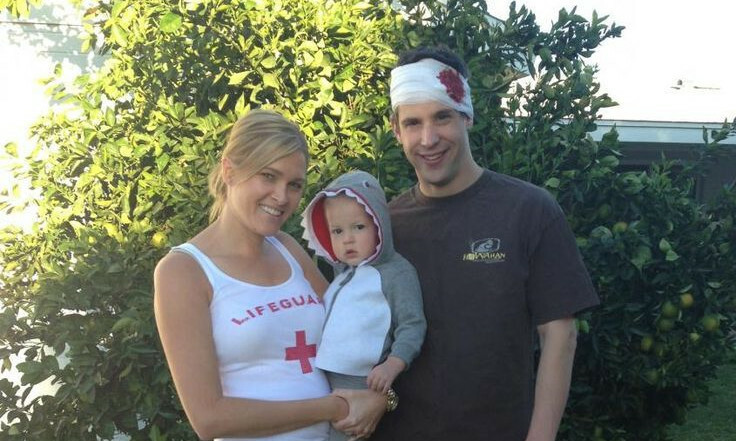 Mom is the lifeguard, dad is the shark attack victim, and baby is the shark. How cute! We love how the new mom looks so svelte in the tank top, while dad is sporting a bloody bandage around his head. And the baby seems quite content to act out his role as the shark. It’s another case of a baby who’s supposed to be scary, but he’s anything but! Eventually, however, he may get in trouble for biting (when he gets teeth). If you were born after 1990, you probably don’t get this reference. But this mom and dad obviously think they’re hilarious. 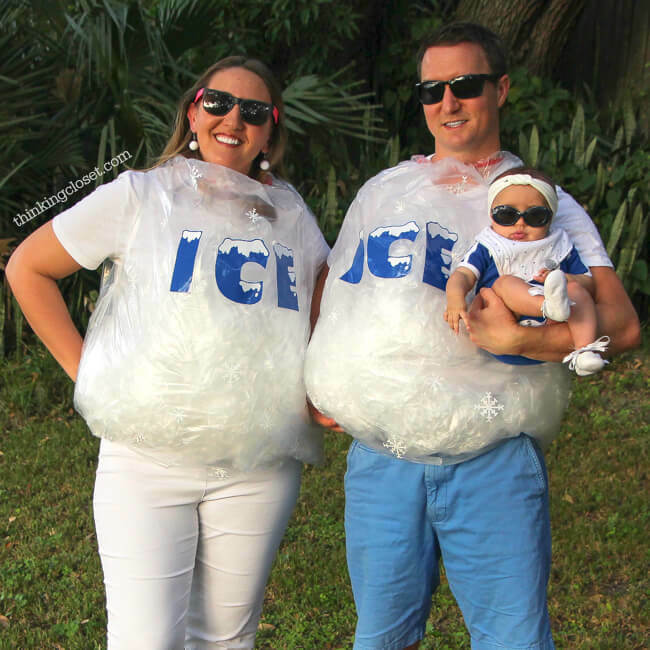 With an infant in their arms, they’re acting out the title to Vanilla Ice’s 1990 hit song, “Ice, Ice Baby.” As you can see, mom and dad are dressed like bags of ice. But they had to write the word “ice” on their costumes so people could figure out what they were. (We deduct points for that). Then all they did was hold their infant, dressed in a pumpkin costume, in their arms. We give them an ‘A’ for creativity but a ‘B’ for execution. 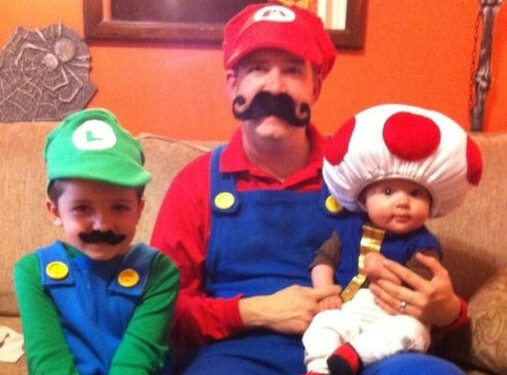 This dad is obviously a fan of the video game Super Mario Bros. He and one of his sons are dresses as Mario and Luigi from the popular game. The infant is dressed, adorably, as one of the mushrooms. In the game, the character gets point when he jumps over the mushroom. One of the things we love about this picture is the baby’s face. He (or she? It’s hard to tell when they’re so small) looks absolutely tickled to be dressed up as fungi. Who wouldn’t? It’s not every day that you can resemble a mushroom and get away with it. We love this family costume idea. 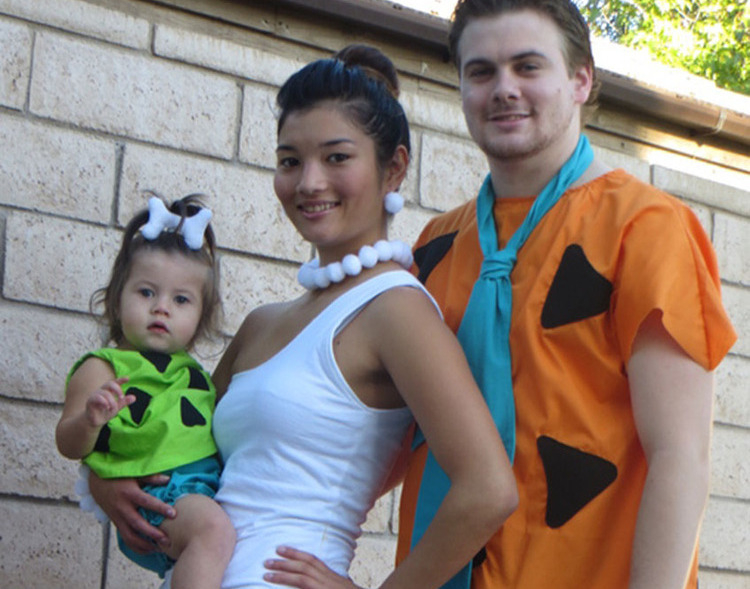 Mom and dad are dressed like Fred and Wilma Flintstone, while their baby is dressed like Pebbles Flintstone. This is a popular costume, and there are several photos of people doing the identical thing all across the internet. We can’t help but wonder if the family resembles the characters they are playing? Fred, for example, has a big heart but is quite insecure and is prone to having temper tantrums. The picture would be even better if it included the Flintstones’ best pals: Barney Rubble, his wife Betty, and their son Bamm-Bamm. 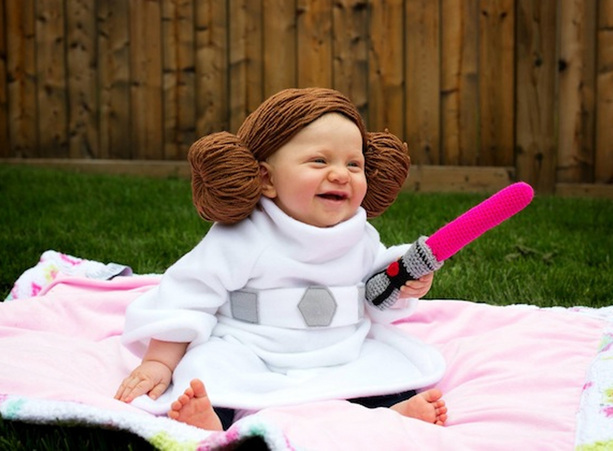 This little girl’s parents are obviously huge Star Wars fans. She’s dressed as one of the most famous (fictional) princesses in the world — Princess Leia! We really love the details of this costume. First, there’s the hair. The baby is sporting what appears to be a yarn interpretation of Leia’s iconic side hair buns. She’s also wearing a costume that’s very similar to the one Leia wore in the first movie. In addition, the baby has a pink light saber in her hands. She is ready to defend herself if necessary. Costumes like this are timeless, and the baby seems happy to wear it! This is just a guess, but we have a feeling this mother is Italian. Why? 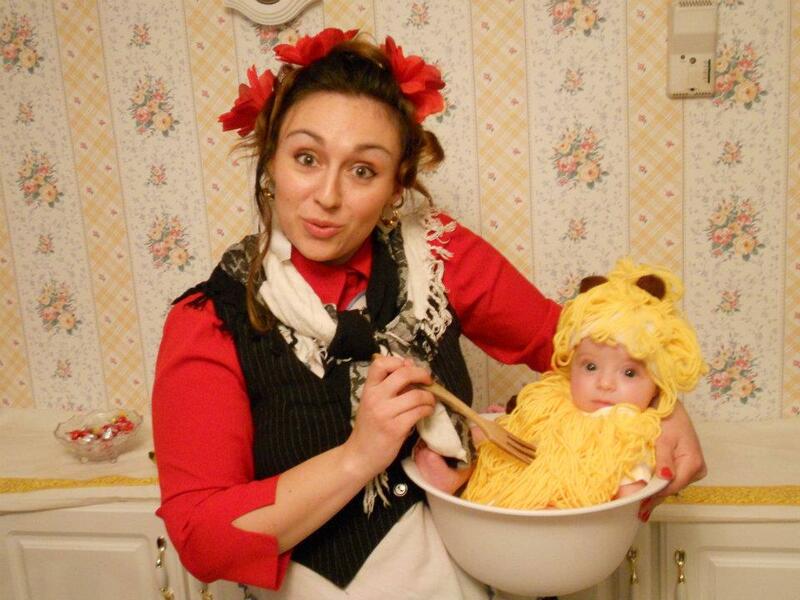 Because she dressed her baby up as a bowl of pasta. This picture is fantastic. Mom is dressed like a stereotypical Italian woman in a red and black dress with matching flowers in her hair. Her baby is playing along with the scenario, sitting quietly and politely in a bowl covered in fake spaghetti. While the picture is quite cute, it doesn’t make us hungry. We don’t want to eat the baby! Check out one of the details on the baby’s costume — those ears are supposed to be meatballs! Some babies are born with hair while others are bald as can be. This little one apparently is the latter. As you can see, he has absolutely no hair on his head, making him a candidate to dress up as many bald characters (Kojack or Lex Luthor, for example). Instead, his parents were inspired by the Peanuts — the cartoon made popular by Charles M. Schulz. 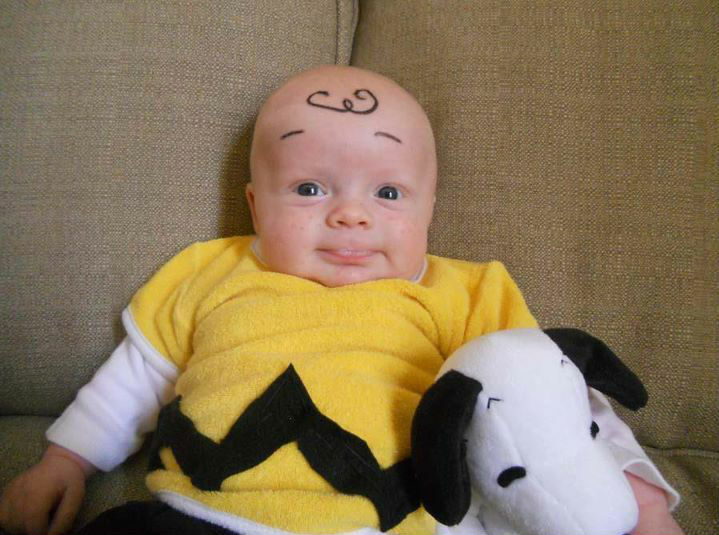 The baby is dressed like Charlie Brown, and the likeness is uncanny! His parents even drew eyebrows and a wisp of hair on his face and head. And of course, he’s clutching his best friend Snoopy in his arms. These two brothers make a great team. 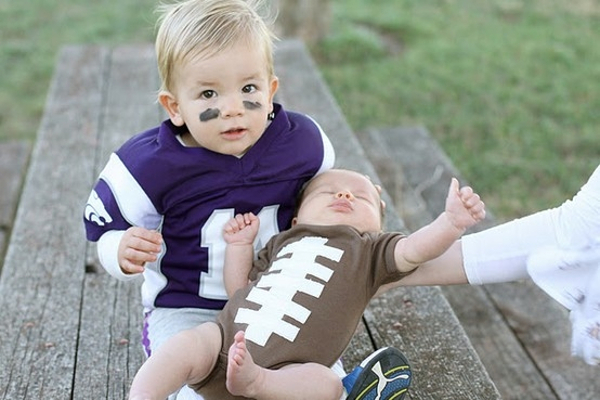 Mom and dad are obviously football fans and couldn’t help but dress their kids up as their favorite sport. The toddler is wearing a blue team uniform and is holding his infant brother, who is adorably dressed as a football. But we hope the older brother doesn’t actually treat his sibling like a football and throw him around. He may look like a ball, but he’s definitely a baby. The football costume almost look homemade, which makes it even better. Mom and dad put a lot of effort into dressing up their boys for Halloween. Even though Elvis has been dead for almost 40 years, people still love the King of Rock ‘N Roll. They love him so much that they dress up their babies to look just like him! Take this little one. He’s obviously a caricature of Elvis from his older years (when he was a little pudgier around the middle). But it makes sense. You’ve heard of baby fat. This baby has an uncanny resemblance to the singer. His hair is curled around his forehead just so, and he has a tiny little guitar strapped to his body. Viva Las Vegas! It looks like this mom and dad are carting around their triplets. Three times the fun! It must be hard to come up with costume ideas when you have three children that are the same age. Well, these parents nailed it. They are the bee keepers, and their babies are the honey bees! 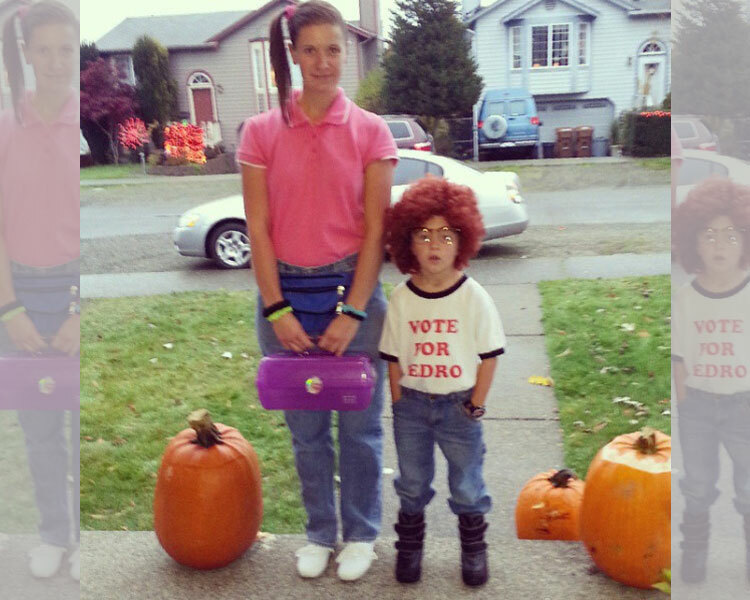 What we love about this picture is the commitment the parents put into their costumes. They have to be hot because they are covered in material from head to toe. And their three tiny bees are just adorable (look at their antennas!). They also decorated the wagon with flowers. 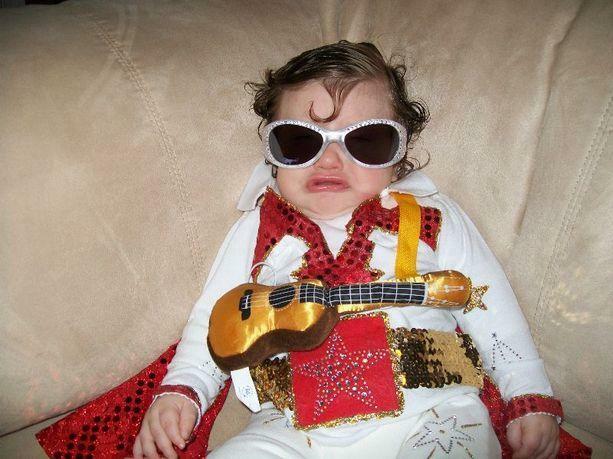 This newborn doesn’t look too thrilled to be in this position, but we must say that this costume idea is quite clever. Mom and dad decided to make a special picnic basket with the baby as the main attraction. She is dressed up like a box of Triskets. She even has the crackers on her head. It won’t be too long before she no longer fits in a picnic basket, so it’s clear that her parents made the right call while thinking of the costume idea while she was still very little. They also remembered to include a bottle of wine in the basket. 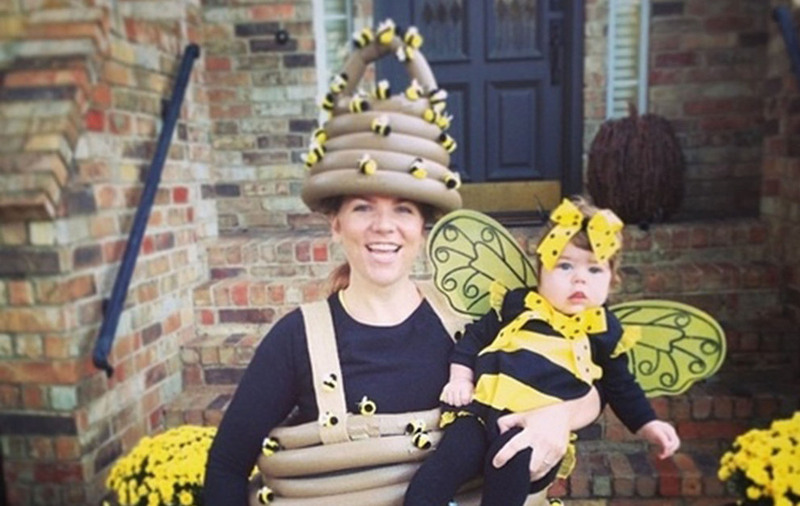 This mom took the honey bee theme into a different direction. Instead of being a bee keeper, she’s a bee hive! We love how she made her costume. It’s very obvious that she’s a bee hive with the coils around her head and body. She also glammed her baby up in a very bee-like costume. The baby is wearing a black and yellow-striped onesie with black tights. She has bows on her head and around her neck and is sporting giant wings. And nothing says fall like Mums and a pumpkin in the background. Do you agree that this is a buzz-worthy costume? 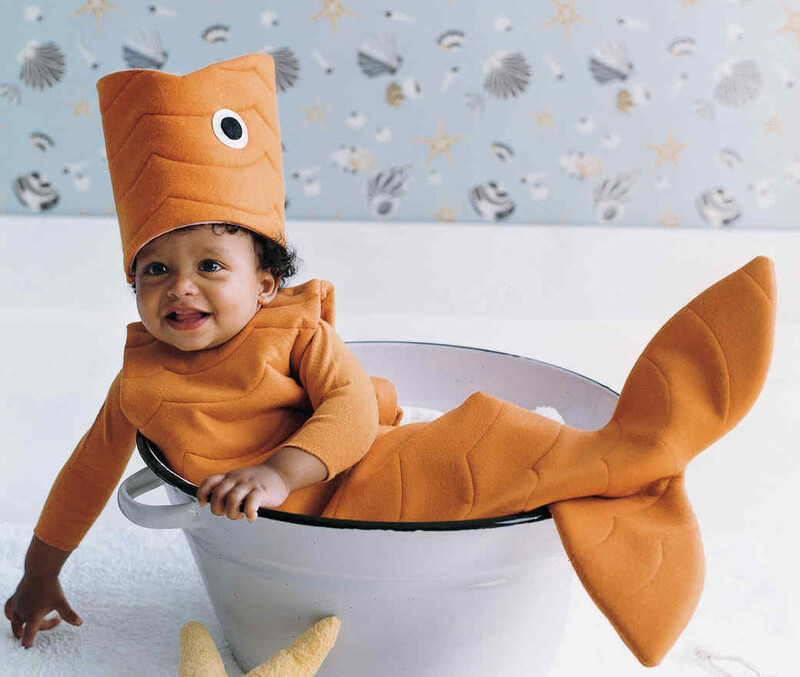 There’s something about parents dressing their kids up like fish that’s really cute. This little one is supposed to be a goldfish. Mom and dad somehow managed to get him in the costume, with his hat on, into a bucket for a photograph. The baby looks like he’s having a good time and doesn’t even mind wearing a silly hat. Lots of kids don’t like hats, so this is a big deal. And because the baby can’t walk yet, it’s okay that his feet are covered in fins. We give two thumbs up for this creative fish costume. 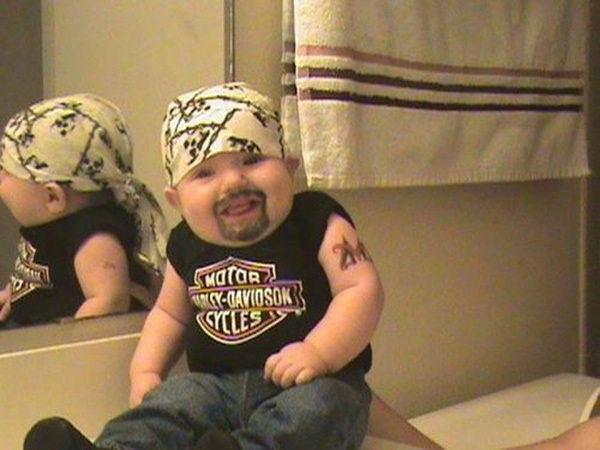 This baby looks like a stereotypical biker. First, he’s wearing a Harley-Davidson shirt. He also has a bandana on his head and is sporting a mustache and goatee (which apparently was drawn on with either make-up or face paint). He’s wearing jeans and boots (standard biker attire). But the best part is the drawn-on tattoo on his left arm. What would a biker be if he didn’t have any tattoos? We can’t help but wonder if the parents are actual bikers or were just having fun with their little one. Either way, we wish he had been photographed riding his hog. This baby makes an adorable taco. She’s so cute, we want to eat her up! It’s unclear if the infant can crawl, but it looks like she can. So you can imagine her waddling around, looking like the delectable treat. Hopefully the household pets didn’t mistake her for a snack! 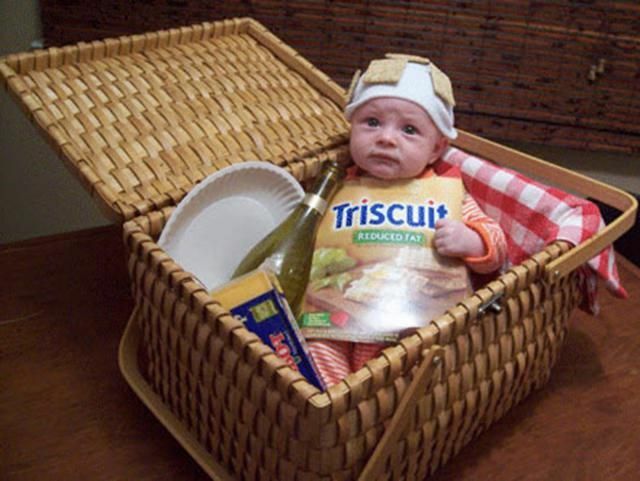 People love dressing their kids up as food. There’s something about babies and tacos and pizza and ice cream that melts our hearts. 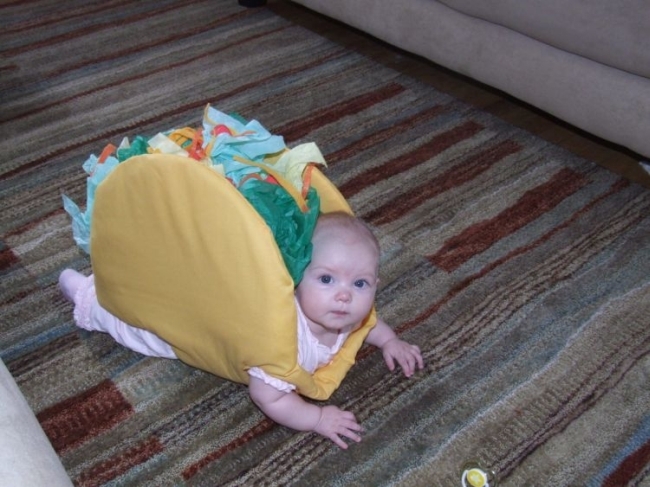 We’re not sure why, but seeing a baby dressed as a taco puts a smile on our face. Or maybe that’s just hunger? Three cheers for taco baby! Everyone in this family looks happy except for the poor kid that has to play the hotdog. Oh, well, you can’t please everyone all of the time. This is a pretty funny picture. 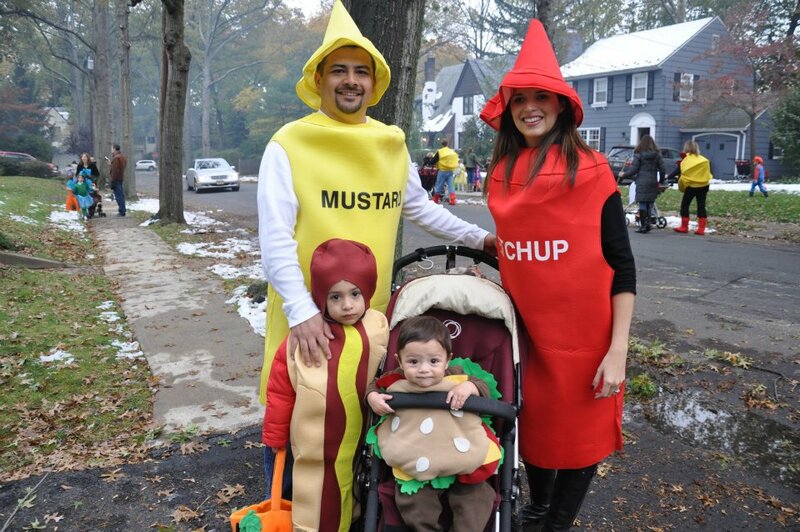 Dad looks happy to be mustard, and mom looks just as content to play ketchup. The baby is adorable as the hamburger. But let’s face it, who really wants to dress up as a hotdog? We know everyone eats them, but when you think about what they’re made of, it can be a little gross. Either way, this family seemed to be having fun while trick-or-treating in their neighborhood. Yes, it’s another food costume! 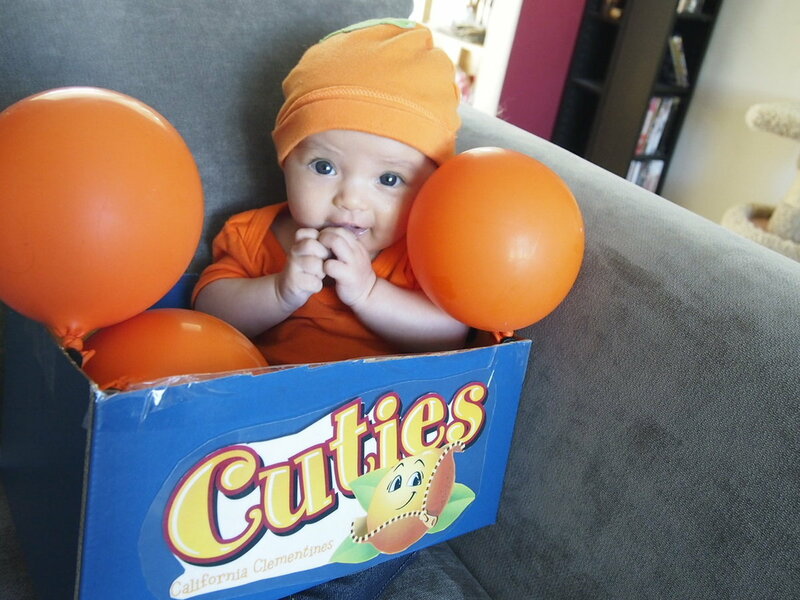 Here’s a baby in a box of Cuties. If you’re not familiar with them, Cuties are delicious mandarins and clementines that are grown in California. It seems fitting that the baby, who is definitely a cutie, is included in a box of Cuties. She’s wearing an orange cap in order to fit in alongside the fake, orange balloon cuties. We get what the parents are saying here. They love their daughter so much and consider her their cutie. We agree! What’s great about infants is you can dress them however you like. Then they become teenagers. We all seemingly have that one crazy nat lady in our neighborhood. You know, the old lady who rarely seems to leave her house, but she does, emerges in a fluffy robe, messy hair, and with 10-plus cats in tow. That’s not to imply that there is something wrong with this lifestyle. After all, lounging in comfy clothes all day while surrounded by cute cats sounds pretty dang good. 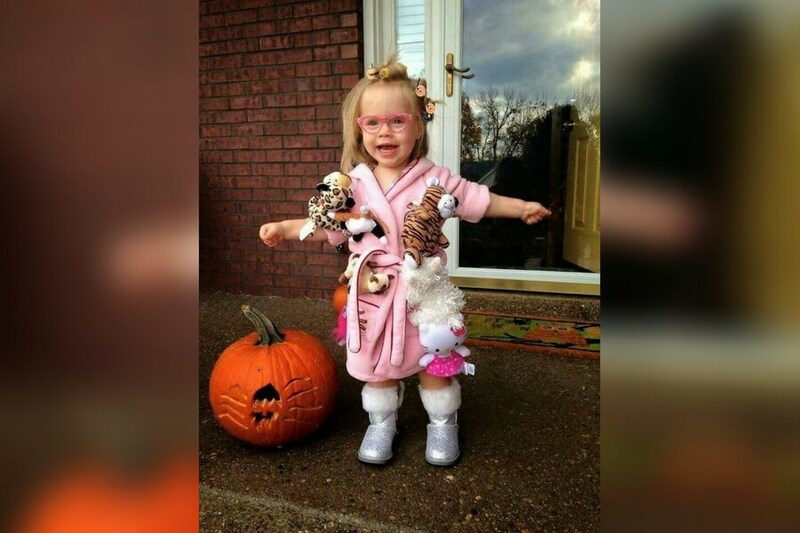 This little girl’s parents used their neighborhood crazy cat lady as inspiration for their daughter’s Halloween costume, and they totally nailed it! Albert Einstein was one of the most influential people science (and the world) has ever seen. The guy developed the theory of relativity and won the Nobel Prize in Physics for crying out loud. This little guy’s parents were obviously inspired by the late physicist so much that they decided it was the perfect Halloween costume. Between the wild grey hair, unkempt mustaches, suspenders, and the big stack of books, we gotta say they hit the nail on the head with this one! 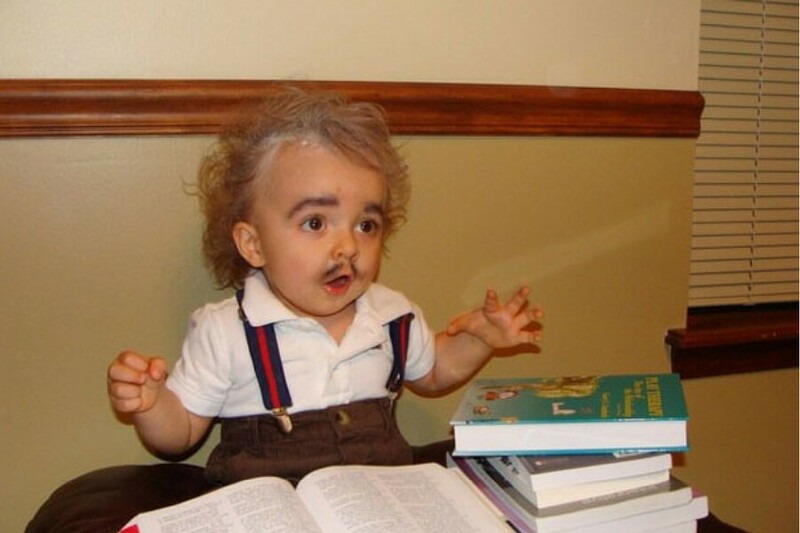 Not to mention, babies dressed up as little old men is never not funny. This has to be one of the most hilarious and grossest Halloween costumes to date! 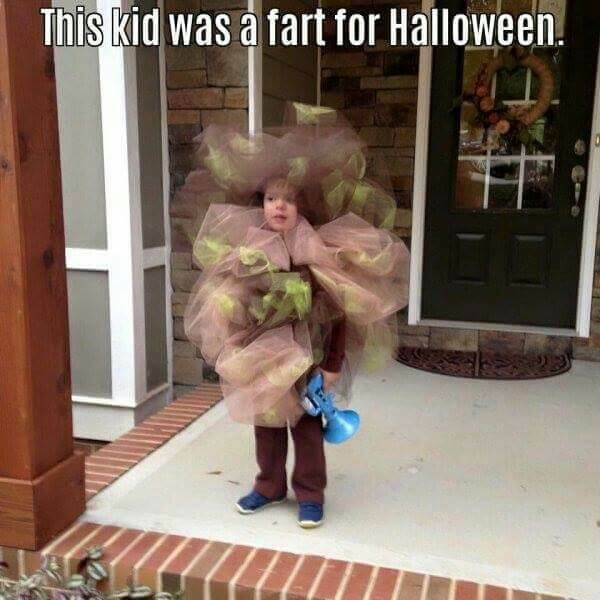 When this young boy told his parents he wanted to be a fart for Halloween, they weren’t quite sure whether to say yes or no—but when they go him the go ahead, they needed to figure out how to pull it off. With a quick trip to the store, his mom helped transform brown and green fabric tulle into the mess you see above. The simple addition of a fart sound machine ties it all together and makes it pretty dang convincing! This picture is great for so many reasons. For starters, we’ve never seen a baby dressed as Gandhi for Halloween and this costume is perfect. 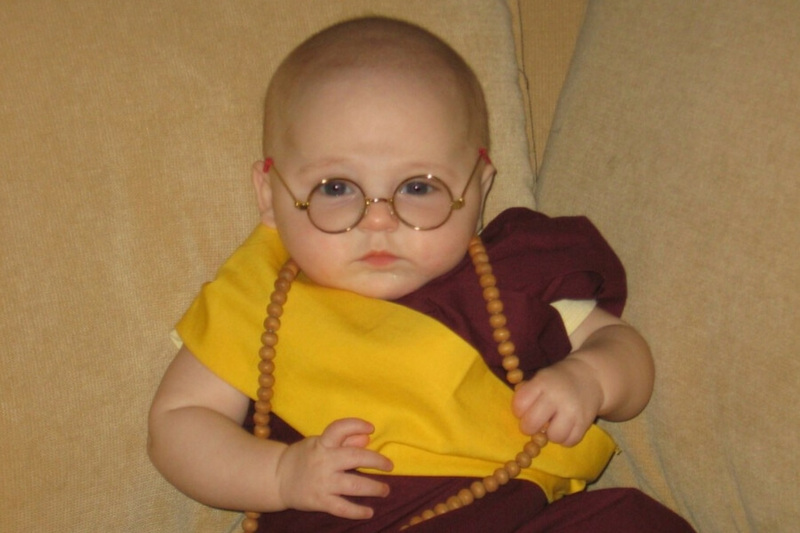 He’s got those great round glasses and even a Gandhi-inspired necklace perfect for a teething baby. Two, just look at this kid’s expression. The majority of hilarious baby photos almost always have a grumpy baby who is less than pleased to be dressed up for an occasion. But this little guy clearly takes his Halloween costume very seriously and was determined to play the part. He just looks so peaceful! Trick or treating with a baby can be difficult, especially for those youngins who can’t walk far distances. For this reason, lots of parents take their babies trick or treating in wagons, but wagons usually take away from the costume. 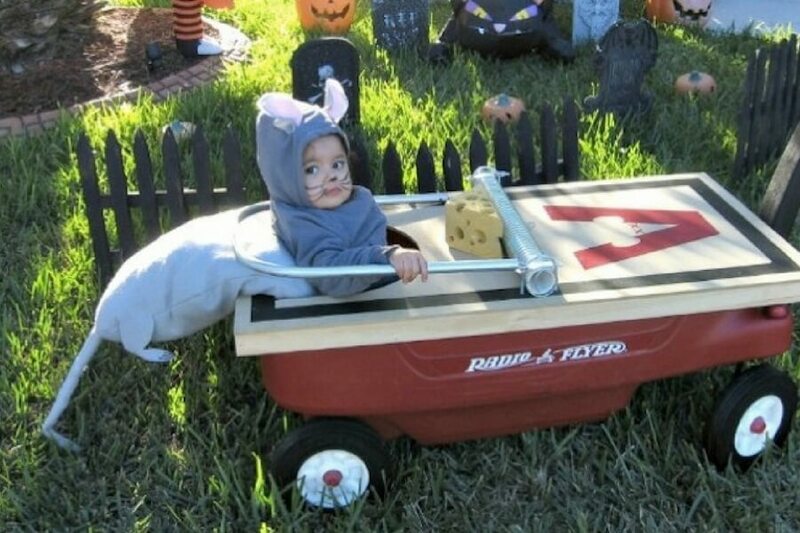 This little guy’s parents thought ahead and knew they wanted to incorporate their son’s wagon into his costume in a creative way and they went above and beyond. Not only is this mouse trap costume absolutely adorable, but you know this kid got to trick or treat in comfort and style all night! We’ve gotta give babies credit. After all, they are forced to dress up in ridiculous Halloween costumes at the will of their parents and can’t really do a thing about it. Take this baby for example. By the looks of it, this little guy isn’t exactly sure what’s going on, but he knows that he doesn’t quite like it. Either way, his creative costume and skeptical expression make for a priceless Halloween photo. We’re just wondering what his parent’s inspiration was for this adorably hilarious costume. Perhaps mom and dad are chefs? Or maybe, they just really love lobster? Pass the butter, please! Oompa loompadoompadee doo, I’ve got a perfect puzzle for you. Oompa loompadoompadee dee, if you are wise you’ll listen to me. What do you get when you guzzle down sweets? Eating as much as an elephant eats? What are you at getting terribly fat? What do you think will come of that? I don’t like the look of it! 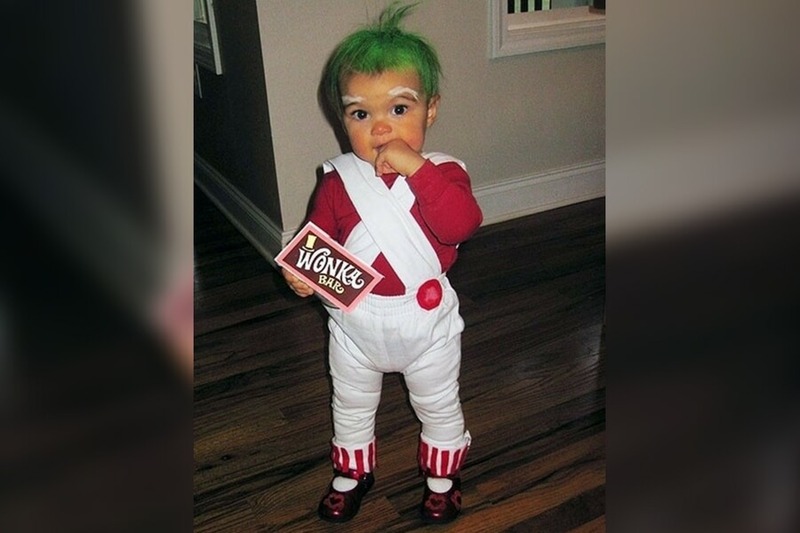 Considering this is a Halloween costume and the holiday is all about the sweet treats, the Oompa Loompa tune is especially fitting. We wonder how much candy this little guy ate! It’s always funny to see little kids perfectly impersonate characters from a movie you know they haven’t even seen. 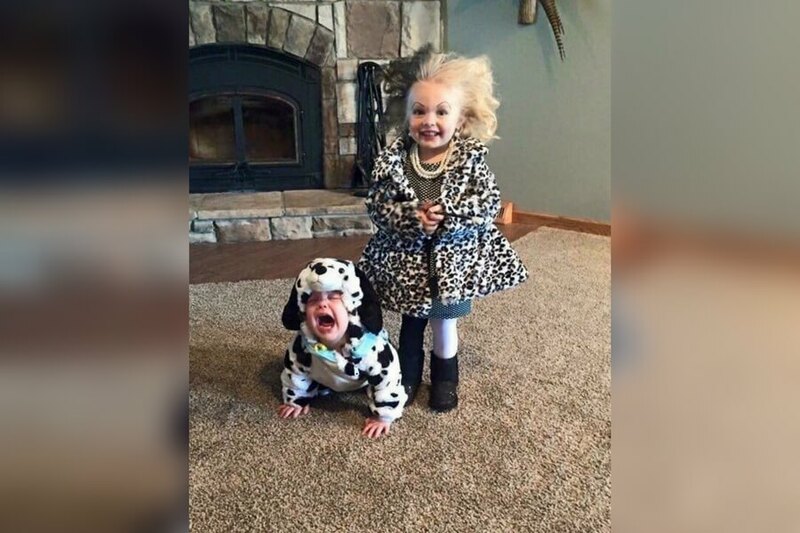 Take for example these hilariously adorable sisters in their Halloween costumes. Their parents wanted to pay tribute to their favorite movies—the ’90s cult classic Wayne’s World—and we think they pulled it off perfectly. 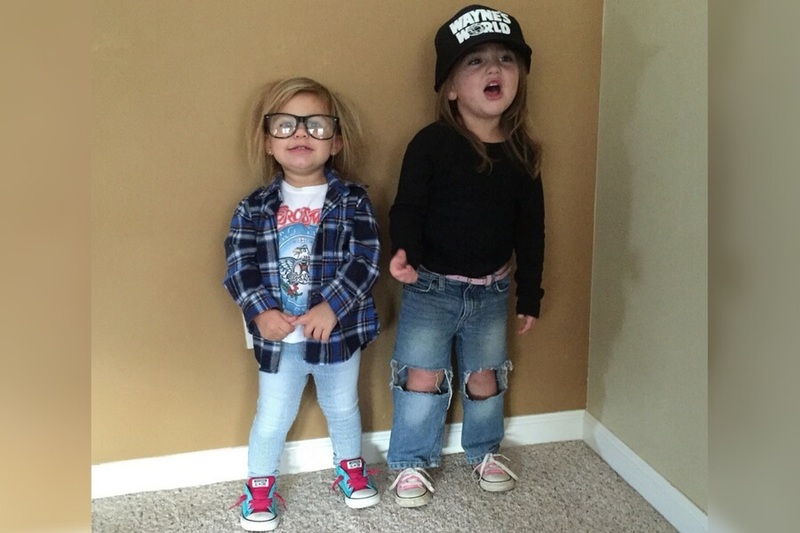 Between the sneakers, ripped denim, flannel, glasses, and hat, these girls look exactly like Wayne and Garth. Their dazed expressions just make it that much better! We wonder if they quoted the film all night though? We’re not worthy…we’re not worthy! Is She Doesn’t Scare You, No Evil Thing Will! 101 Dalmatians is one of the most memorable Disney movies of all times. 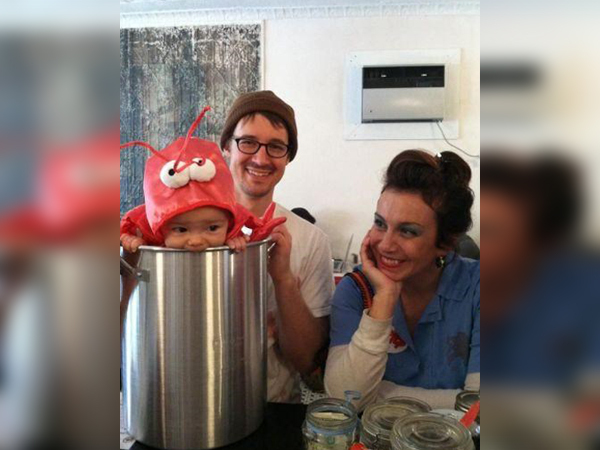 So this brother and sister’s parents deemed it the perfect Halloween costume for their kids. We’ve gotta give it to them—they nailed it! The big sister’s hair is perfectly reminiscent of Cruella de Vil with its two-tone color and wild blowout. She even has the slightly evil grin down. Her little brother though? While he definitely looks cute as ever in his spotted costume, he isn’t exactly having the best time. Hopefully getting candy changed that! It’s amazing how creative some parents get when it comes to Halloween costumes for their family. Take this couple for example, who was inspired by the famous Vanilla Ice song “Ice Ice Baby.” What makes these costumes even greatest is that it’s not particularly apparent what they’re supposed to be. 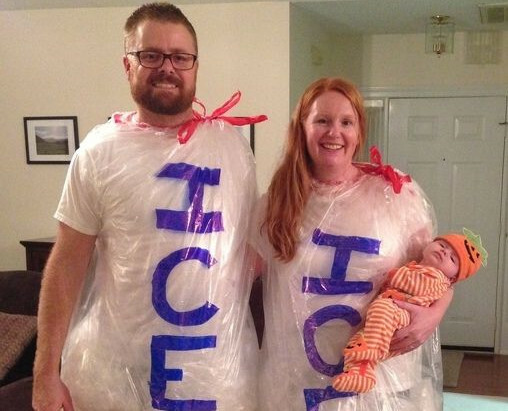 But once you read the word ‘ice’ across mom and dad’s chest and then see dad holding their baby, it all clicks and hilarity ensues. Best of all? This costume is super funny without much effort to make the costumes.